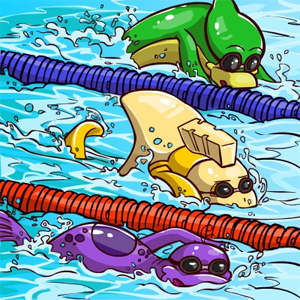 The Marapets Olympics in Lush Lake is where your pets can show off their sporting skills by competing in Olympic Sports Events with other pets and players on the site. You can enter an event once every 2 hours per pet. Each event has 5 contestants, including your pet. You will receive the results of the event by an alert once the other contestants have entered. The winning pet will receive an Award for their profile and Olympic Points to spend in the Olympic Redemption Shop. The Olympic event will change once every week. Buy a Multiple Pet Olympics Giftbox item and you can enter all of your pets at once! Buy an Olympics Giftbox item and you can use Olympics twice as often for life!